Happy Hummer: Draw a Bird Day, July Issue (and 100 Face Challenge, #69)! I decided some time ago that I wanted to paint a hummingbird this month in watercolor for DABD, since July is also World Watercolor Month, sponsored (and created) by our friend Charlie O’Shields over at Doodlewash. I sketched them over and over, head, beak, body, you name it, I even painted one a couple of times in a sketch book, based on an illustration from a book. I wasn’t happy enough with the artwork to share them. Then an amazing photographer by the name of Emily Carter Mitchell of Bella Remy Photography posted this shot of a hummingbird yesterday that she worked with an engineer to orchestrate! And let me tell you, it’s a beaut! She graciously gave me permission to use her beautiful, crisp image in my painting today. And boy, did it give me a huge hand up! Thanks again, Emily! Are we dancing? I think it’s time! Speaking of which, I just have to share a link to this video from Britt Nicole, as the song “Headphones” came on my Pandora station while I was painting this yesterday, and now I can’t get it out of my mind. I dare you not to dance when you hear this; it’s so zippy and happy! Happy FRIDAY and I hope you enjoy the dance today! Peace. Thanks, I think this is Denis? I appreciate your comment! Love the little hummer! Happy DAB Day, Laura, and have a great weekend! Yay and Happy DABD to you too, Michael! Enjoy the days, relax if you can! Oh loo! Beyootiful!!!! Movement expressive. Delicate. Detailed. Exquisite. Haha, very funny Laura. Thank you! Thanks, Kathy! I learn a lot from Jodi. I needed to show more fluttering and movement and couldn’t think of any other way to do it! Glad you enjoyed it. Gorgeous and, like Kathy, I love the flecks around the wings. Thanks, Michael. I feel like it gave her more of a feeling of movement. Glad you like it! I love hummingbirds. Boy them little suckers can be mean though! I got sick of fights by the feeder some years ago and took the feeder down. I don’t have near the fights I used to. Poor birds thought that sugar water was crack! I tried to put them through rehab, but other neighbors enable them. I am surprised they still come to see me! The little tiny babies are so cute…so so tiny and nosey! Anyway, I think your hummingbird is good lookin and I enjoyed the painting. Thank you. Me too! It was fun. I love this! It looks so real. The texture is amazing. Happy Draw a Bird Day! It’s my first one in months so I was pretty excited. I actually really like drawing birds, I’ve missed it. I love your hummingbird. It’s really lovely. My father-in-law has dozens of hummingbird feeders and gets hundreds of the hummers. It’s so loud on his porch you can hardly hear yourself think. He goes through so much sugar it’s unreal. Love your hummingbird. Such a beautiful color, and the detail is perfect. Thanks, Judith. It’s a journey, as you know. I’m usually never happy with any realistic paintings, preferring abstract work. Really glad you joined in with an imaginary bird. Great idea! I really enjoyed painting my bird this month. It was fun to play with colors. Love your hummingbird, Laura! So delicate and so sweet! Hi-five, my bird tutor! Woo I’m a bird tutor, I feel so special! 😀 Thanks, Carrie! Glad you enjoyed! I love your Hummingbird especially the iridescence on its head, and the eye. You do eyes wonderfully well. I’ll have to check out that brush you used for the eye. Deborah, it’s been one of those days, looking forward to seeing your birdie. So glad you joined us, and I’m glad you enjoyed this one. It would probably look very odd if I posted lots of eye paintings, but I truly love drawing and painting eyes. It is so much fun! What a lovely work! 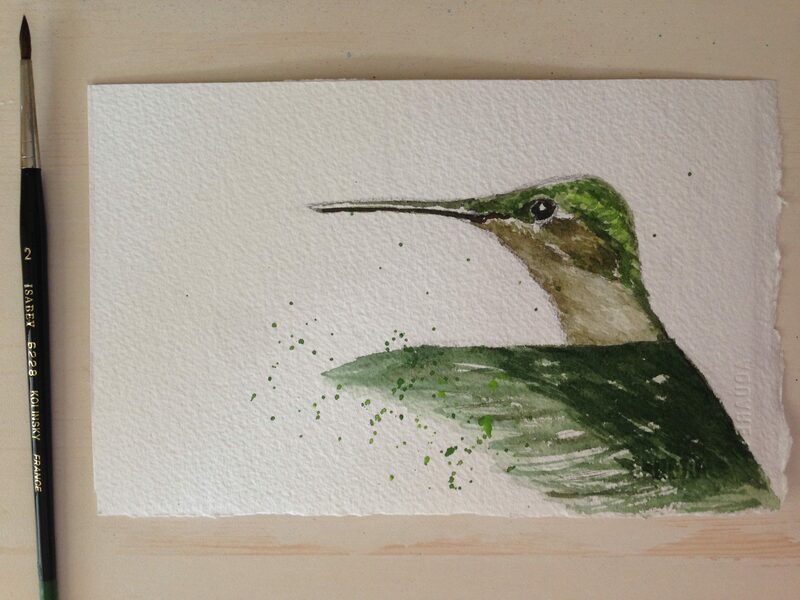 A hummingbird was one of thr first pieces I painted in watercolor and sold! I definitely need to return to that subject matter and butterflies as well. Can’t help but smile when you’re painting butterflies :-). Yes, hummingbirds can present a real challenge, but they are very worth it. I love experimenting with the colors! I’m excited to follow and see what you have to offer! Always glad to have you visit my corner of the blogosphere :-). Hi Laura. I find watching our hummers to be so relaxing, which is odd because they are anything but relaxed! Your splatter helps to sum up the frenzied motion of this delightful bird. TGIF! I apologize, I totally forgot it was bird day. Darn it. Great. It’s on my to do list. Hummingbirds are always welcome! And another great eye. Here’s my link, and thanks for hosting! Love your hummer, Laura! Funny how you and Jodi both chose this bird for today! 🙂 And thanks again for hosting! Jill, they are swarming in front of my kitchen sink window constantly and it’s hard to forget them for a second! But they are surprisingly hard to paint and draw. Their heads have odd little shapes, but the prelim sketches I did for this painting really helped me understand them, finally! Thanks, Jill! Emily’s photo was incredible – never could have done it without it. This is amazing considering that you wear steel toes boots! ha! see! 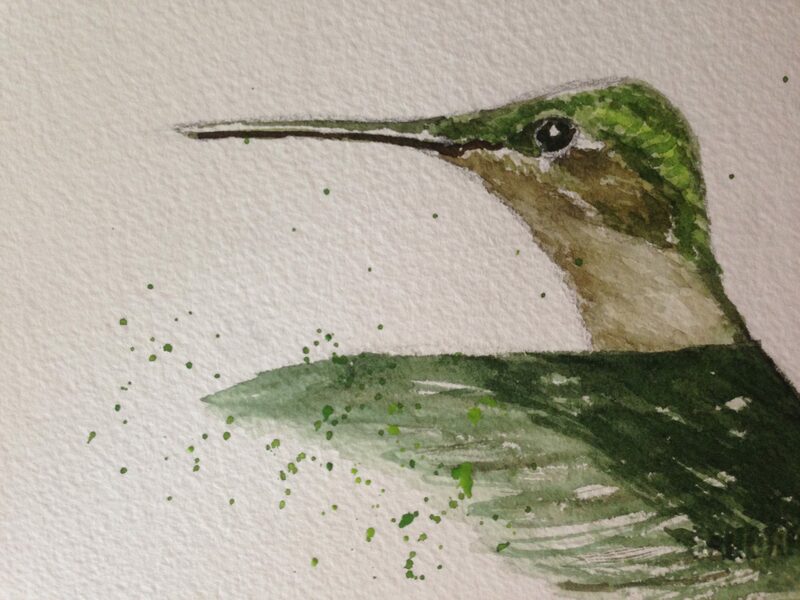 you can do it…..I had a hummingbird come up to me today while en plein air painting and she talked to me, I have no idea what she said but it sounded wonderful. I love birds and here I have never done a painting of one! what the heck is wrong with me? okay…..so I will give it a whirl next week if not this weekend….I have oodles of favorite birds, so this will be hard! Yay for hummers, thanks Carolina, love your birdie! this month we got the same idea hummers are so nice with all their colors! Gorgeous painting, Laura :-)! I recognized Emily Carter Mitchell’s photo right away. Such an incredible photo and you did a wonderful job painting it. Those greens and golden grey-browns! Very pretty, Laura! Another fan of the flicks of paint around the wings and the motion it gives to the painting – seems your hummingbird is certainly dancing! Yay, thanks, Annie, glad you enjoyed it! Love this little hummer Laura! Thanks, Snehal! Glad you like my hummer and thanks for the link! So glad you are enjoying DABD! Beautiful painting, elegant and jewel-like as a Hummer would be. Thank you for sharing this sweet gem. I can tell you are a great blogger, very social and giving! Thanks for your support! Thank you, Heni! So glad your crow made its way over here, I just love it! Wow! That’s fantastic, Laura! Well done! Thanks, Frank! Sorry I’m just seeing this comment! Beautiful humming bird, looks so real! Thanks Victoria! Emily’s photo helped immensely. She’s an amazing photographer.